History | Land and Sea Marine, Inc. Installing vinyl sections for a seawall restoration. With more than 10 years doing business in central Florida, Land and Sea Marine has achieved and maintained an A+ rating from the Better Business Bureau, and membership in good standing with the Florida Marine Contractors Association. Our history of quality speaks for itself. Hundreds of marine construction projects successfully completed from Cape Canaveral to Key Largo, with consistent client satisfaction ratings. A portfolio of top-quality commercial and residential work, from complete marina restoration to high-end residential and commercial seawall and dock projects. All phases of construction quality control verified with in-house structural engineering and management by a Florida licensed structural engineer. Project status and progress updates communicated with owners and interested parties through individual project web site administered by our staff. Full factory material warranties supported. Our reputation depends on your complete satisfaction, and our number one priority is to achieve the highest quality results. 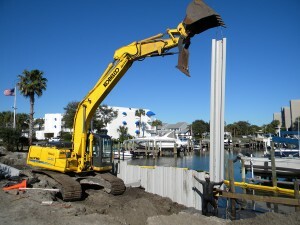 At Land And Sea Marine, Inc. we pledge that your project will be managed by knowledgeable, experienced professionals and assembled by experts in modern marine construction methods. We never declare a job complete until your total satisfaction is achieved and we can finalize it with a handshake and a smile.